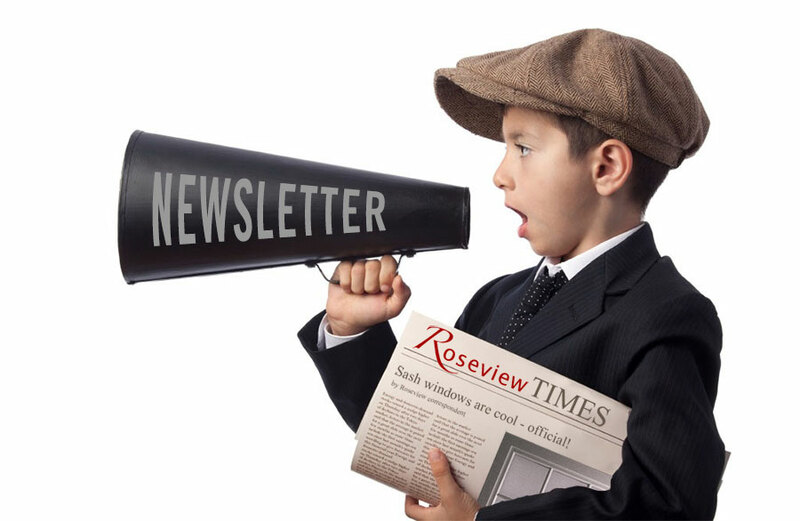 It’s been very busy at Roseview since our last newsletter. Once we’d got past the G16 Awards and the Christmas break, we went straight into our 40th Anniversary in January. We welcomed our original owners – Lindsay and Fred – back to our factory in Olney for a presentation and celebration of our 40 year history. You can read all about it on our blog. Since then, we’ve been focusing on the next FIT Show, which is approaching fast! It’s at the NEC in Birmingham from May 23-25, and we’ve got a much stronger presence there this year compared to last. Read more later in this newsletter, where you’ll find a link to register for free, queue-beating tickets. Apart from that, we’ve been working really hard on improving our customer service even more. Last year’s G16 Award was just the start – there’s a lot more to come! Keep reading for more news and info about what we’ve been up to. And if there’s anything here you’d like to talk to us about, we’d love to hear from you. Call our team on 01234 712657 or email us at hello@roseview.co.uk. 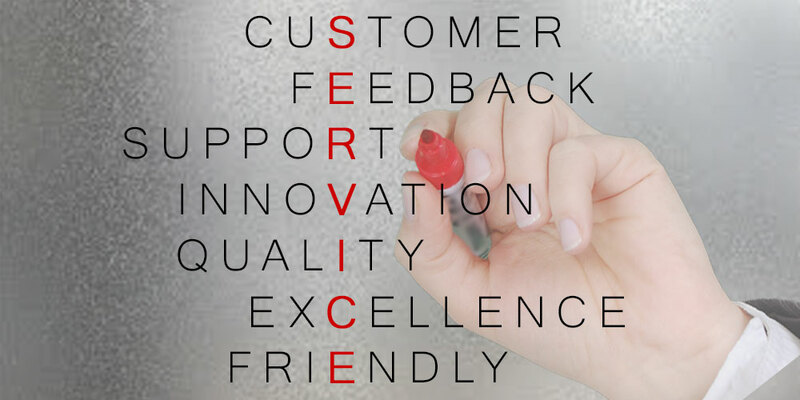 We’ve always prided ourselves on providing a complete and flexible service for our customers. Our goal is not just to supply industry leading sash windows – although that’s key – it’s to supply those windows on time, on budget, to an exceptional level of quality and with the minimum of fuss. In short, we want our customers to know that when they buy from Roseview, they can buy with confidence. To achieve that we’re constantly reviewing and updating our processes, to improve our customers’ experience. Last year we were delighted to win the G16 Customer Care Initiative of the Year Award, as it showed that we’re moving in the right direction. But we set ourselves very high standards, and we haven’t reached them yet. …we want our customers to know that when they buy from Roseview, they can buy with confidence. 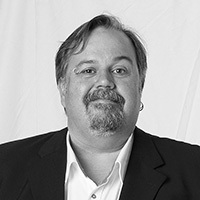 We’ve grown our customer service team and brought Mick – our most experienced field engineer – into the office full time to talk directly to customers, offering first line help and advice. We’ve taken on new staff in several departments, including Sales, QC, IT, deliveries and operations, making us faster to respond. We’ve upgraded our IT infrastructure, and are in the process of improving our in-house software systems to improve our speed and efficiency. We have a reputation for innovation, and we’re committed to continuing that with new products, enhancements and technologies in the pipeline. We’re always looking for ways we can improve our products – like using a carrier bar for astragal bars instead of tape and clips (which we changed last year). We’re continually investing in new and better machinery and equipment, helping us improve quality, consistency and efficiency. As well as implementing a new internal training programme, we’ve updated our free customer training sessions delivered by our MD Willie Kerr. All of this is designed to allow us to continue moving forward, cope with ever-increasing demand for our products and – most importantly – make us responsive and reactive to our customers’ needs. We’ll never be completely happy, and there’ll always be room to improve. But continuing to push forward is our number one priority. So please let us know how we’re doing. What are we doing well? What are we doing not so well? What else could we be doing that we don’t currently do? Feedback from our customers is crucial, so please get in touch! You can email us or fill in our website contact form. We’d love to hear from you! If you follow us on Twitter (we’re @RoseviewWindows) you’ve probably seen us mention our #SashShots and #SashSelfies competitions. 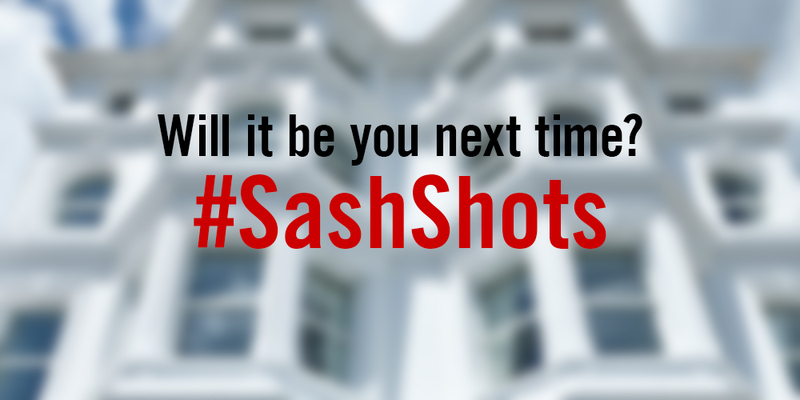 Starting in January, we’re running a monthly photo competition called #SashShots. The idea is simple – just send us a photo of a Rose Collection sash window installation you’ve completed and send it in to us, by Twitter or email. Each month we’ll pick our favourite photo, and the winner will get a bottle of bubbly. Simple! Then, at the end of the year, we’ll take the 12 monthly winners and put them to a vote, and the overall winner will get a fantastic DSLR camera. So, why not take part? You get to show off your Roseview sash window installations, and you could win yourself a prize. For more information on how to enter, and to see our previous winners, check out the #SashShots page on our website. The FIT Show has quickly become the biggest industry event of the year. It’s the one UK event where the people who sell and install windows, doors and conservatories gather to meet the people and companies who manufacture them. And we’ll be there! We exhibited at the FIT Show for the first time last year, at its original home in the Telford International Centre. It was a real eye-opener for us. Although we only had a relatively small stand, we couldn’t believe how busy we were and just how many people came to see us (and, of course, our sash windows). For large chunks of the three day show our stand was two or three deep with people waiting to get on and see what we were offering. And it’s fair to say that by the time the show closed, we were shattered! It was a fantastic response, so it made it easy to decide to exhibit again at Fit Show 2017. And this year we’re going bigger and better! This year the FIT Show is at the NEC in Birmingham from Tuesday 23rd May to Thursday 25th, and will be 50% bigger than last year’s show. It opens at 10am every day, and – for the first time – will be open late on Tuesday 23rd, until 8pm (they’re calling it “Big Tuesday”). This year our stand will be more than twice the size of last year’s, and it’s in a great location very near to the two main entrances. We’ll be showing off the same product range as last year – all three sash window models in the Rose Collection plus secondary glazing from our sister company Incarnation Windows – but there’ll be a lot more space to move! We’ve even built in a meeting area where our customers can have a proper chat with us over a cup of coffee in a bit of peace and quiet. Also, just like last year, we’re putting the emphasis on meeting up with our existing customers. Clearly exhibitions like this are a good place to meet new prospects, but for us it’s just as important to meet the people we already know and who already buy from us. It’s a great opportunity to have a chat, see how things are going, see what we can improve, and perhaps show people a little more of what we do. There’s also a bit of a theme this year. As you may already know, 2017 is Roseview’s 40th Anniversary, so we’re planning to celebrate – along with our customers – at the FIT Show. We’ll be having a reception on our stand on the Tuesday evening (at about 5pm), and celebrating throughout the show. We’ll make sure we’ve got plenty of drinks and nibbles available, and there’s bound to be some cake! If you’ve visited the FIT Show before you’ll know about the queues to get in – they can get very long! However the good news is that you can walk straight past those queues straight into the show by using our invitations. We’ve been busy sending invitations out in the post over the last week or so, but and even easier way to get in is to register online and print out your show pass in advance. So simply click the button below, enter your details, print out your pass and you’re done! Bring your pass with you to the show and you can walk straight in without queuing. beat the queues with free tickets! So we hope to see all of you at the FIT Show in May – come and see us on stand M20 near the main entrance doors. Better still, drop us a line to tell us that you’re coming and we’ll look out for you – you can even book an appointment with us in advance. 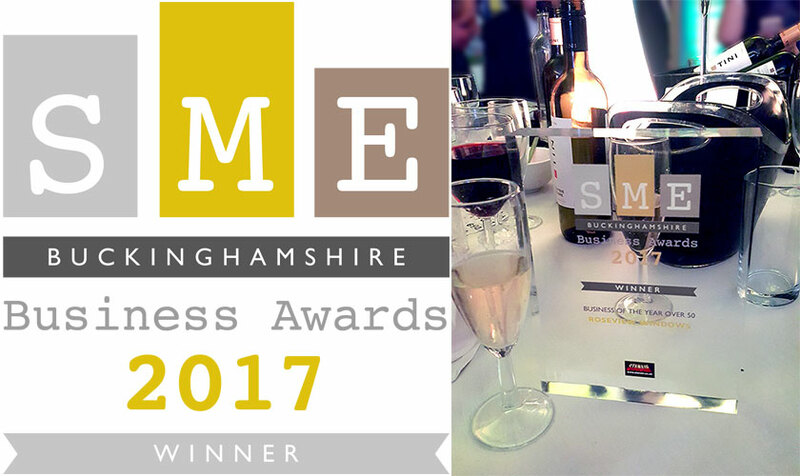 We’re delighted to have won the Business of the Year (over 50 staff) award at the SME Buckinghamshire Business Awards. Although we’re a nationwide manufacturer, we’re very proud to have been based in Buckinghamshire for the past 40 years. Our business is built on our staff, most of whom live in Bucks, and delighted to have contributed to the Buckinghamshire economy for 40 years. Receiving this this recognition from the SME Awards is just the icing on the cake. Five of us attended the Gala award ceremony last week to receive our award. Held at the DoubleTree Hilton hotel at the MK Dons stadium. We enjoyed some champagne, met friends new and old, and partied the night away! 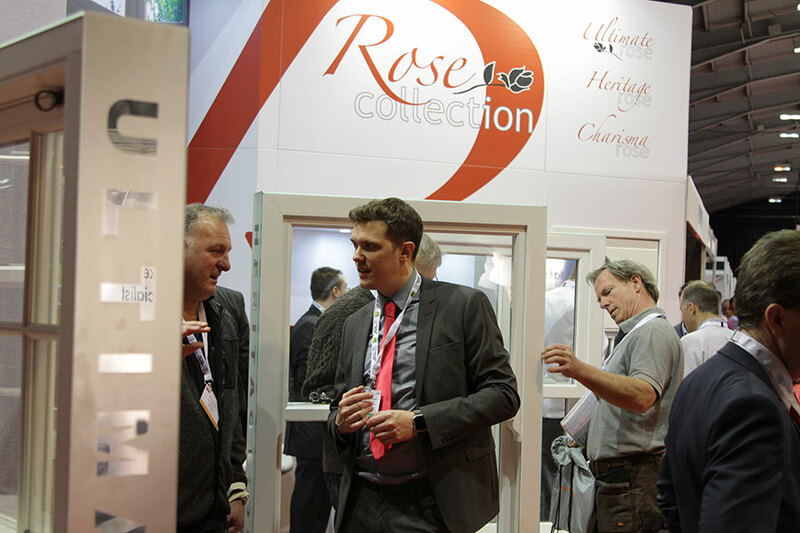 Secured by Design is now fully available on our Ultimate Rose MkII window, meaning that all our windows are now SBD. Welcome to Emma, Gary and Tommy, who have all joined Roseview this month. More on this in the next newsletter. We have an exciting range of product developments and enhancements in the pipeline. Watch this space! Thanks for taking the time to read our latest newsletter – I hope you enjoyed it! As ever, we’d love to hear your comments on the newsletter or anything else that we’re doing. You can leave your comments on the web version of the newsletter, drop us a line through our web contact form or email me at mike [dot] bygrave [at] roseview [dot] co [dot] uk.